27 years ago a wall went down & there was hope for a brighter world. @HedwigOnBway is throwin a bday party tonight. All are welcome & loved. HAPPY BDAY YAMBO I LOVEBYOU DAWG DOING IT FOR THE HIGLIGHT REEL...BLKOUTBOYZ FOR LIFE. Happy Bday bhai @RifatJawaid - visionary journo of his own style! Wish you all the best in everything! What does BDAY stand for? What is the meaning of BDAY abbreviation? 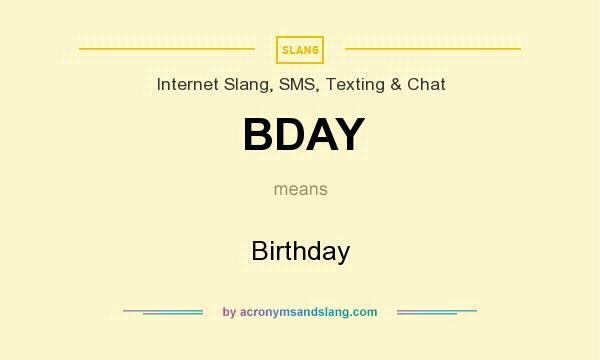 The meaning of BDAY abbreviation is "Birthday"
BDAY as abbreviation means "Birthday"